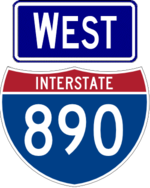 Interstate 890 is a short freeway serving Schenectady and providing access between the Thruway and downtown. Most of the freeway was built by 1974, with the westernmost section built in the late 80s. This section replaced NY 5S, which ran along Rice Road (part of which is now the GE service road, and part of which was upgraded into I-890) and Erie Boulevard to end at NY 5. 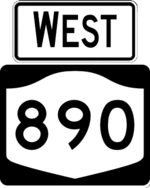 Plans called for an extension across the Mohawk River, and at one time, further into Saratoga County as a western bypass of NY 50 in Glenville. 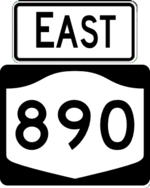 A piece of this extension was built in 1998 as NY 890. 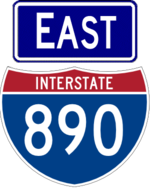 I-890 was given mile-based exit numbers as part of an experiment in the 1970s.